Last-minute rulings from the U.S. Supreme Court on reproductive rights, the president's travel ban and union dues all affected people in Washington County. A series of decisions handed down in the waning days of the 2017-18 U.S. Supreme Court session are resonating throughout Washington County. They revolve around reproductive rights; President Trump's travel ban for immigration from largely Muslim countries; and union dues. In the case of the National Institute of Family Life Advocates v. Becerra, the Supreme Court ruled that a California law requiring religiously affiliated crisis pregnancy centers to provide people with information on how to obtain an abortion was unconstitutional. The California law, titled the Reproductive Freedom, Accountability, Comprehensive Care, and Transparency Act, or FACT Act, was intended to keep these pregnancy centers from misleading women as to what their options were, and what services the facilities provided. In its June 26 decision, the Supreme Court ruled 5-4 that the FACT Act violated religious pregnancy center's free speech rights. In Oregon, no such law has ever existed. However, crisis pregnancy centers do exist in Oregon. In the Portland area, there's the Pregnancy Resource Center, which has locations in Beaverton, Gresham, Clackamas and Southeast Portland. It is run by First Image, a Christian organization. "The recent ruling on NIFLA v. Becerra will not change our operations at this point, since it did not uphold the California law," said Larry Gadbaugh, the CEO of First Image, in an email to the Times. "As the majority opinion stated, the California law was a violation of our free speech, attempting to compel us to promote something that is contrary to our mission and message by forcing (centers) to act as advertisers for abortion." Pregnancy Resource Center's website does state clearly that it is not an abortion facility. Gadbaugh said that when a woman visits a Pregnancy Resource Center location, she is given information on parenting, adoption and abortion — though it is the center's mission to "encourage and support a woman who faces a difficult pregnancy decision to consider birthing her baby or making an adoption plan instead of getting an abortion." "Our educational materials on abortion are reviewed by our national and local certified medical doctors for accuracy and objectivity," Gadbaugh added. 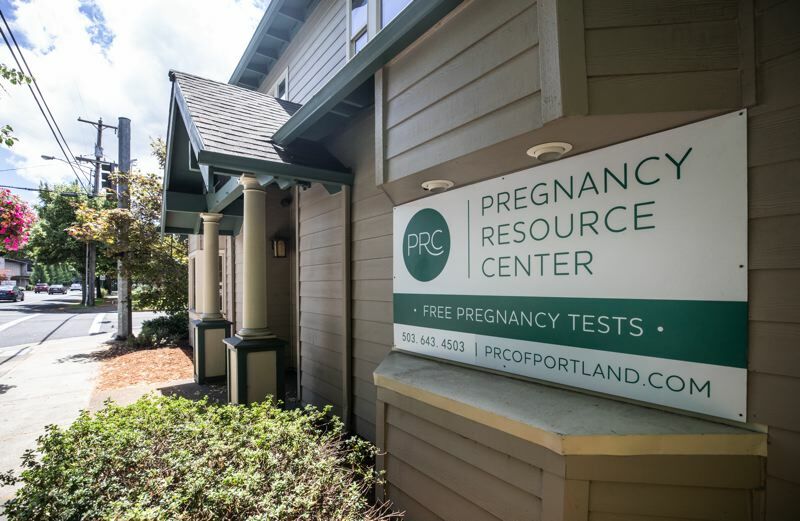 Emily McLain, Planned Parenthood Advocates of Oregon's executive director, said that places like the Pregnancy Resource Center are "deceptive and harmful to women." "And really nothing in this Supreme Court decision suggests otherwise," she added. "We believe that no business has the right to falsely advertise, or not tell the truth or lie to consumers." McLain said she knows women in the Pacific Northwest who have walked into a crisis pregnancy center under the impression that it was an unbiased medical clinic, only to be discouraged from obtaining an abortion after entering the facility. While Gadbaugh said he agreed with the Supreme Court's framing of the issue as a matter of free speech, McLain said that a woman's right to safe and accessible health care should supersede that issue. The issue of abortion is likely to come up again soon in the Supreme Court. Justice Anthony Kennedy, a reliable pro-choice vote, recently announced his retirement from the Court. President Donald Trump's nominee to replace Kennedy, Brett Kavanaugh, does not have a substantial record one way or the other on reproductive rights. However, some are speculating that should Kavanaugh be confirmed, Roe v. Wade — the landmark 1973 case that enshrined the right to an abortion at a federal level — possibly could be overturned. Gadbaugh did not want to speculate on what Kavanaugh could mean for abortion rights, or for pregnancy centers like his, saying that "we are motivated to care for women regardless of the political tug-of-war that continues over abortion." McLain, however, said that Planned Parenthood opposes Kavanaugh's nomination. "The President made his litmus test, that he would only appoint justices that would, and these are his words, 'automatically overturn Roe vs. Wade,'" she said. "We think that Roe is certainly on the line, and the right to a safe abortion is on the line." The Supreme Court, in a 5-4 vote, upheld the third version of President Donald Trump's travel ban affecting five majority Muslim nations — Iran, Libya, Somalia, Syria and Yemen — plus North Korea and Venezuela. The first two versions listed other majority-Muslim nations. Iraq was dropped in the second version; Sudan was dropped in the third version, and Chad was dropped before the court ruled. Richard LaMountain of Cedar Mill praised the decision. "A president's foremost responsibility is to protect our country. By restricting entry of hard-to-vet people from hotbeds of Islamic radicalism, President Trump fulfilled that responsibility," said LaMountain, a former vice president of Oregonians for Immigration Reform, which supports more restrictive immigration. "The Supreme Court fulfilled its responsibility as well," he said. "Federal law (U.S. Code 1182) gives the president the unambiguous authority to 'suspend the entry of all aliens or any class of aliens' he finds 'detrimental to the interests of the United States.'" LaMountain was a chief sponsor of the 2014 measure in Oregon that overturned driving privileges for people who cannot prove legal presence in the United States. Kayse Jama, executive director of Unite Oregon, offered a differing reaction. "As a Muslim-American, I am heartbroken and I am calling on all people in this country to stand in solidarity with our immigrant/refugee communities and the people this administration is targeting," said Jama, whose organization supports immigrant and refugee rights. It joined the Coalition of Communities of Color in a recent report about minority communities in Washington County. "The U.S. Supreme Court legalized religious and ethnic discrimination and gave the president broad powers to selectively exclude people who he deems to be undesirable." The U.S. Supreme Court usually is cautious about overturning precedent. But on June 27, the court ruled 5-4 in the case of Janus v. the American Federation of State, County and Municipal Employees, eliminating the ability of public-sector unions to collect so-called "fair share" fees from non-union workers. The court majority ruled that forcing non-union members to pay — even though the benefit from collective bargaining — violates non-members' free speech rights. The decision overruled Abood v. Detroit Board of Education, which had stood since 1977 and which OK'd the power of labor unions to collect fees from non-union members. In Oregon, people on both sides of the issue the ruling could weaken unions and, in turn, strengthen government employers. But many also say they were not surprised to see the court overturn four decades of precedent. That's because Neil Gorsuch joined the court last year and was widely expected to vote against the union position. "I think it's a huge development for Oregon and all of the other states that are not 'right-to-work' states," said Steve Buckstein, senior policy analyst for the Cascade Policy Institute, which often takes conservative positions and opposes government-sector labor unions. Twenty-eight states currently have "right-to-work" laws, which ban unions from negotiating contracts that require all members who benefit from the union contract to contribute to the costs of union representation. None of the West Coast states have "right-to-work" rules, although Idaho and Nevada do. The Cascade Policy Institute labels itself as "libertarian," rather than "conservative," he said. Jeff Klatke, statewide president of the American Federation of State, County and Municipal Employees, or AFSCME, called the Janus decision "pretty important" but added that his organization had seen the decision coming and had begun planing plans for it. Oregon AFSCME represents about 26,000 workers, Klatke said. About 89 percent of them are members; about 11 percent are not, and it's that group that no longer must pay dues. Since the confirmation of Justice Gorsuch, he said, "We'd been ready for this. ... We felt pretty confident that he was going to be the fifth vote to overturn the precedent." The ruling will cut into union funding, Klatke said. "We have had to make some staffing changes because of this. We held positions vacant. Now we won't fill them." Sara Schmitt is the president of the Beaverton Education Association, or teachers union, which represents about 3,000 members. She said the court ruling came in the summer, when a lot of teachers are on vacation, and don't think about work or politics. But this ruling was different, she said. "I'd say people are fired up." Organizations that oppose union positions have begun distributing fliers to teachers' homes, alerting them that they can drop out of the dues-paying ranks. "We're getting word from a lot of members .... who've been invigorated by this. They just don't think that's right," Schmitt said. She said the association plans to communicate more with educators as the school year draws nearer. That includes both members and nonmembers. "That's already begun, and so far I'm hearing, really loud, quite a few positive responses," Schmitt said.